As the implantation and long-term existence of tumor-specific T cells in host are the prerequisite for adoptive immunotherapy, memory stem T cells (TSCM) with self-renewal and differentiation capacity show the greatest potential to implant and long-term exhibit function in vivo, compared with other T cells of differentiation stages. Hence, tumor-specific TSCM have become potential candidate for adoptive T cell therapy of cancer. Here, we reported a protocol to generate allogeneic antigen-specific CD8+ TSCM cells from human PBLs. To prepare allogeneic antigen-specific CD8+ TSCM, we used an LCL named E007 of defined HLA allotyping as simulator, a co-culture of E007 and allogeneic PBLs was carried out in the presence of differentiation inhibitor TWS119 for 7 days. Sorting of proliferation cells ensured the E007-specificity of the prepared TSCM cells. 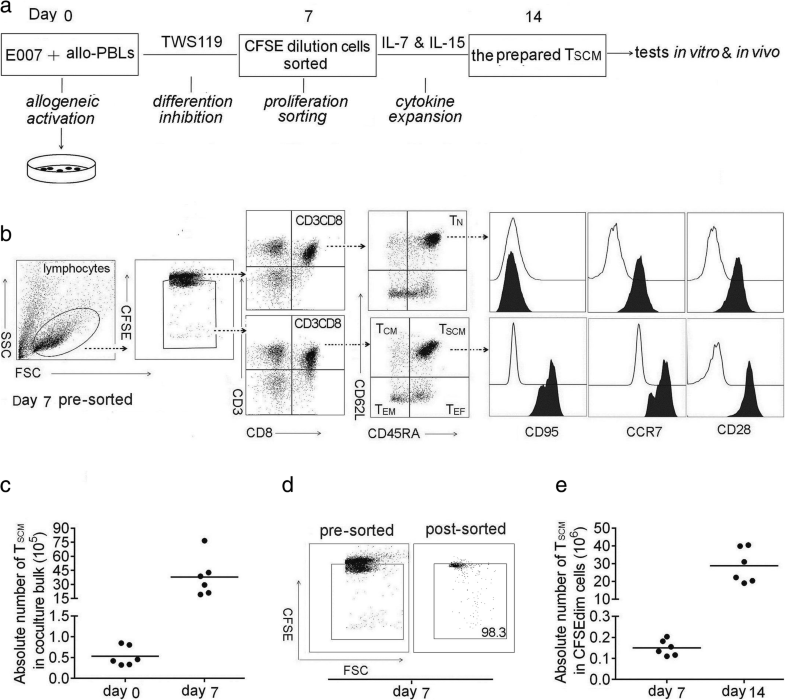 The sorted lymphocytes underwent further expansion by cytokines IL-7 and IL-15 for further 7 days, making the E007-specific CD8 + TSCM expanded in number. The stem cell and T memory cell properties of the prepared CD8+ TSCM were observed in NOD-SCID mice. Our protocol began with 1 × 107 PBLs and resulted in 2 × 107 E007-specific CD8+ TSCM cells in 2 weeks of preparation. The prepared TSCM cells exhibited a proliferative history and rapid differentiation into effector cells upon the E007 re-stimulation. 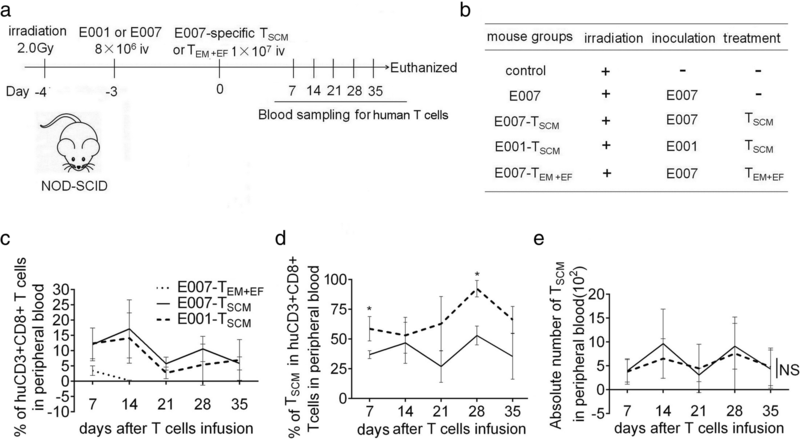 Importantly, the prepared TSCM cells were able to exist long and reconstitute other T cell subsets in vivo, eradicating the E007 cells effectively after transferred into the LCL burden mice. This protocol was able to prepare allogeneic antigen-specific CD8+ TSCM cells from human PBLs. The prepared TSCM showed the properties of stem cells and T memory cells. This study provided a reference method for generation of antigen-specific TSCM for T cell adoptive immunotherapy. Adaptive immunity is an effective strategy for cancer treatment. T cells are the main force to combat microbes and cancer cells in adaptive cells [1, 2]. However, T cell is heterogeneous, which exists in a continuum of differentiation states. According to differentiation stages, T cells can be divided into naive T cells (TN), memory stem cells (TSCM), central memory cells (TCM), effector memory cells (TEM) and differentiated effectors (TEF) [3, 4]. Adoptive T cell therapy (ACT) for clinical application is normally based on the use of terminally differentiated TEF cells, which have short lifespan and inferior engraftment capacities [5–7]. TSCM is defined as the earliest developmental stage of memory T cells, which possesses capacities of self-renewal and differentiation [5, 8]. Phenotypically, TSCM can be identified by the expression of CD3+ CD45RA+ CD62L+ CD95+ CCR7+ CD28+ [5, 9–11]. TSCM has longer lifespan, as it is reported TSCM is able to be tracked in vivo for 12 years after infusion of genetically modified lymphocytes . In particular, TSCM mediates longer and more robust efficiency of tumor rejection in vivo compared to other memory and effector subsets [5, 6, 8, 12–14]. It is these characteristics that make TSCM a good candidate for immunological cytotherapy of cancer. TSCM constitutes a small proportion of the T cell subset, 2–4% of the total T cells in peripheral blood [5, 8]. The premise of antigen-specific TSCM used for clinical therapy is to accomplish in vitro TSCM preparation in a large number. It is demonstrated that small molecule chemical inhibitor TWS119, a potent inhibitor of the serine–threonine glycogen synthase kinase 3β (GSK-3β) able to induce the Wnt-β-catenin signaling, helps the enrichment of TSCM through differentiation inhibition both in mice and in human [15–17]. On the other hand, TSCM can be amplified with cytokines IL-7 and IL-15; IL-21 is also reported to promote the generation of TSCM under ex vivo culture conditions [6, 18–26]. Allogeneic hematopoietic stem cell transplantation (allo-SCT) is an effective immunotherapeutic approach with curative potential in patients with malignancies. The therapeutic basis is mainly dependent on the donor T cell alloresponses against the recipient’s malignant cells named as graft versus leukemia (GVL) or graft versus tumor (GVT) effect . T cell responses to alloantigen are of peptide-MHC complex (pMHC) specificity in the same way as those to nominal antigen [28, 29]. Transfer of alloreactive T cells with defined specificity, such as for leukemia- or tumor-associated antigens, is proposed to separate the GVL or GVT effect from the deleterious graft versus host disease (GVHD) [30, 31]. As the implantation and long-term existence of tumor-specific T cells in host are the prerequisite for adoptive immunotherapy, it is of importance to prepare alloantigen-specific TSCM cells in vitro. In this study, we explored a methodology of alloantigen-specific TSCM (allo-specific TSCM) preparing in vitro. Although both CD4+ and CD8+ TSCM cells are reported, we focused on CD8+ TSCM cells. The TSCM cells were generated in an allogeneic co-culture, enriched by TWS119, then sorted with proliferation, and finally expanded by IL-7 and IL-15. Our protocol prepared 2 × 107 allo-specific TSCM cells from 1 × 107 PBLs. An LCL burden mouse model was introduced in for the TSCM cell behavior in vivo. LCL cells were human B lymphoblastoid cells immortalized by EB virus infection. Although this model would reflect lymphoproliferative disorders, the LCL cells in mice could act as allogeneic targets to measure eradication efficacy of T cells in vivo in our study. Importantly, the prepared TSCM cells exhibited both stem cell and memory T cell properties, and were able to implant and effectively eradicate the targets after adoptive transfer into mice. This study provided a practical method for generation of allo-specific TSCM cells in vitro, which would be expected to be referred in preparation of allogeneic TSCM grafts with defined antigen specificity for the purpose of adoptive immunotherapy. Peripheral blood was obtained from healthy donors after informed consent under a protocol approved by the Ethics Committee of Tongji Medical College, Wuhan, China. Peripheral blood mononuclear cells (PBMCs) were isolated by centrifugation through a ficoll-hypaque gradient (Ficoll-Hypaquedensity 1.077 g/ml) and cultured in RPMI-1640 medium supplemented with 10% fetal bovine serum (FBS), then placed in dish for 2 h to remove the adherent cells. The non-adherent cells were collected as peripheral blood lymphocytes (PBLs) for the co-culture. The EB virus (EBV) transformed B lymphoblastoid cell lines (LCLs) E007 and E001 were established in our lab according to reported protocol . HLA typing for LCLs was performed with PCR-SSP . The HLA class I alleles of E007 and E001 are mismatched, E007 carried A*110x, 310x; B*510x, 550x; C*030x, 150x; and E001 A*020x, 240x; B*460x, 540x; C*010x, 080x. Fluorescent antibodies for cells staining included human CD3-APC-Cy7 (clone HIT3a), CD8-BV510 (clone SK1), CD3-Percp-Cy5.5 (clone HIT3a), CD62L-PE-Cy7 (clone DREG-56), CD45RA-APC (clone HIT100), CD45RA-BV421 (clone HI100), CD95-PE (clone DX2), CXCR7-PE (clone 10D1-J16), CD28-APC (clone CD28.2), IL-2-APC (clone MQ1-17H12), IFN-γ-PE (clone 4S.B3), TNF-α-PE (clone MAb11), the above antibodies were purchased from BioLegend, USA. Corresponding isotype for each antibody were used as isotype control. Cells were analyzed on a BD LSR flow cytometer. T cell subsets were determined using fluorescence minus one (FMO) controls for interesting antibody. Allogeneic PBLs were co-cultured with the E007 for raising alloreactive TSCM cells. PBLs were stained with 5 μΜ carboxyfluorescein diacetate succinimidyl ester (CFSE, sigma) for 8 min at 37 °C and washed with RPMI1640 supplemented with 10% FBS three times. E007 were inactivated by irradiating (2.0 Gy). PBLs were mixed with E007 on day 0 at a ratio of 5:1 with 5 μM TWS119 in the co-culture for the first week. PBLs cultured alone used as control. TWS119 and medium were replaced on day 4, and cells were counted by Trypan blue dye exclusion. As the allo-specific T cells showed proliferation in the co-culture, CFSEdim cells were sorted by FACS with BD FACS AriaII on day 7. Sorted cells were expanded by cytokines IL-7 and IL-15 (Peprotech, USA) of 25 ng/ml each for a further week. T cell subsets in the co-culture bulks were identified by their surface markers, CD3+ CD8+ CD45RA+ CD62L+ CCR7+ CD95+ CD28+ for TSCM, CD3+ CD8+ CD45 RA- CD62L+ for TCM, CD3+ CD8+ CD45RA- CD62L- for TEM, and CD3+ CD8+ CD45 RA+ CD62L- for TEF. Allo-specific TEM and TEF cells were prepared by a co-culture of allogeneic PBLs with E007 set up as above, but no TWS119 was added. CFSEdim cells were sorted on day 7. Sorted cells were further expanded by 300 U/ml IL-2 (Peprotech, USA) instead of IL-7 and IL-15 for a further week. The prepared TSCM cells were incubated with E007, E001 cells and Dynabeads Human T-Activator CD3/CD28 (α-CD3/CD28) (Gibco, USA), respectively, in a 5:1 ratio. Cells were collected at 6, 12, and 24 h, and labeled with corresponding fluorescent antibodies for differentiation assay. The TSCM cells incubated with the above stimulations in the presence of 1 × BFA (eBioscience, USA) were collected for intracellular IFN-γ, IL-2, and TNF-α staining after 4 h incubation. Samples were analyzed on BD Verse flow cytometer. The data analysis was performed with Flowjo software version 10.0 (Tree Star). T cell subsets in the co-culture were sorted by BD Aria II flow cytometer based on the corresponding phenotypes on day 7. Total DNA of the T cells was isolated using a genomic Extraction kit (Takara, Japan), following manufacturer’s instructions. TRECs of T cell subsets were detected using fluorescently quantitative PCR kit (Takara, Japan) with TREC-specific primers  on Bio-Rad CFX Sequence detection system. 6-week-old female NOD-SCID mice were purchased from Vital River Lab Animal Co, Ltd. (Beijing; a distributor of the Jackson Laboratory). Animal experiments in this study were approved by the Ethical Committee of Tongji Medical College. The mice were irradiated with 2.0 Gy and randomized in five groups (n = 5), then intravenous injection with 8 × 106 E007 or E001 on day − 3. The mice were injected with the 1 × 107 allo-specific TSCM or allo-specific TEM and TEF on day 0. Blood samples were taken every week from mice after the T cell transfer. The number and phenotype of human T cells in mouse peripheral blood were determined by flow cytometry. The signs of GVHD were monitored daily. Mice were euthanized on day 35 and bone marrow and spleen were removed to detect human T cells and residual LCL cells. The LCL cells were detected by the latent membrane protein 1 (LMP1) of EB virus using antibodies LMP1-FITC (primary antibody: mouse anti-EBV LMP1, clone CS1–4, Abcom; secondary antibody: goat anti-mouse IgG-FITC, clone poly 4053, BioLegend) and flow cytometry. Formaldehyde-fixed spleen specimens were embedded in paraffin and cut into sections for immunofluorescent detection of human CD3+ T cells with antibodies CD3-488 (primary antibody: rabbit anti-human CD3, clone SP7, ThermoFisher; secondary antibody: goat anti-rabbit lgG H&L-Alexa Fluor 488, Abcom) and LMP1-CY3 (secondary antibody: goat anti-mouse lgG H&L-Cy3, Abcom) respectively. Nuclei were stained with DAPI (BioLegend). The statistical significance of differences between two groups was assessed with a 2-tailed paired or unpaired t test. Comparisons of more than two groups were performed by one-way ANOVA with multiple comparison tests. Data are shown as the mean ± standard deviation (SD). Difference were marked as NS, P > 0.05; *P < 0.05; **P < 0.01, and ***P < 0.001. All the data obtained from the study was analyzed using SPSS 22.0 (IBM, USA). To prepare allo-specific TSCM, this study began with a co-culture of a simulator cells and allogeneic PBLs on day 0. The stimulator was an LCL named as E007 with defined HLA allotyping. Due to the difference in HLA alleles among random donors, allo-specific TSCM cells were generated from TN through proliferation during the co-culturing (Fig. 1a). The TSCM were enriched in the presence of differentiation inhibitor TWS119, of which the optimal concentration was 5 μM in the allogeneic co-culture (Additional file 1: Figure S1A B). On day 7, the TSCM cells in the co-culture bulks were defined by the phenotype CD3+ CD8+ CD45RA+ CD62L+ CD95+ CCR7+ CD28+ (Fig. 1b). The inhibition of differentiation in the allogeneic co-culture enriched the TSCM numbers by 100 folds on day 7 (Fig. 1c). As the allo-specific T cells showed proliferation in the co-culture, sorting of proliferation cells ensured the antigen-specificity of the prepared TSCM cells. The sorting reached above 98% purity of the proliferative cells (Fig. 1d). It would be rational that the prepared TSCM cells were E007 specific. After sorting, the cells were cultured in the presence of IL-7 and IL-15 (25 ng/ml each) for the next 7 days. The allo-specific TSCM increased by another 150 folds on day 14 (Fig. 1e). The lymphocyte distribution at this time not only showed the cultural bulks were mainly CD8+ TSCM (60.1 ± 11.2%), but also contained a few CD4+ TSCM (10.4 ± 8.16%), CD3- cells (6.15 ± 5.23%), CD8+ non-TSCM(12.6 ± 3.48%), and CD4+ non-TSCM (10.2 ± 8.66%) cells (Additional file 1: Figure S1D E F). By allogeneic activating, inhibiting differentiation with TWS119, sorting CFSEdim cells, and expansion with IL-7 and IL-15, our in vitro protocol was able to prepare about 2 × 107 allo-specific CD8+ TSCM cells from 1 × 107 PBLs. The number of the TSCM cells was sufficient to meet the needs of the following studies. The TSCM preparation strategy used in this study could be translated into a single epitope-specific TSCM preparation. When the E007 co-cultured with allogeneic PBLs, the precursor frequencies were much higher than those of T cell responses to a single allogeneic epitope. To prepare a single epitope-specific TSCM cells in a large number, a modification with a prolonged cytokine expansion was required (Additional file 2: Figure S2). To examine the self-renewal capacity, TN, TSCM, TCM, and TEM cells were sorted by their corresponding phenotypes from the co-culture on day 7 (Fig. 1b). The content of T cell receptor rearrangement excision circles (TRECs) in each subset was examined by real-time qPCR. As TRECs cannot be replicated while cell division, the content of TRECs reflects the frequency of T cell proliferation. Results showed that TN had the highest content of TRECs. TSCM, TCM, and TEM cells possessed less TRECs, confirming they were differentiated from TN through T cell clonal proliferation (Fig. 2a). The content of TRECs in TSCM cells was between those of TN and TCM cells, suggesting TSCM was at the earliest stage after TN activation. The prepared TSCM cells were relabeled with CFSE and exposed to IL-2 (200 U/ml) for 10 days. As IL-2 is a potential promoter for T cell proliferation and differentiation, seven generations of CFSE-diluted daughter cells developed. 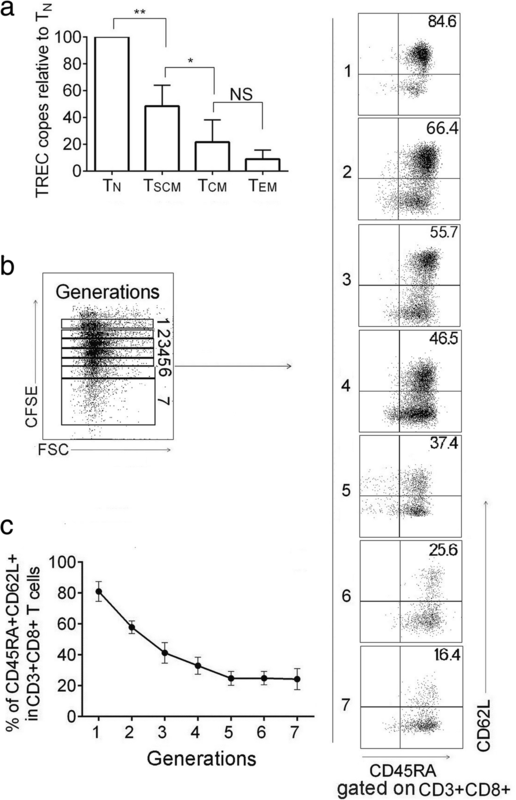 A portion of TSCM cells (CD45RA+ CD62L+) were found in each generation, indicating that the prepared TSCM cells were able to maintain a stem cell phenotype during proliferation and differentiation (Fig. 2b, c). Collectively, the prepared TSCM cells showed characteristics of self-renewal. To check memory T cell characteristics, the prepared TSCM cells were incubated with the cognate stimulator E007, HLA class I mismatched E001, and α-CD3/CD28 beads. Phenotypic analysis revealed that the E007-restimulated TSCM cells showed vigorous differentiation in 6 h, which became more intensive with prolonged stimulation time. A similar response was observed in the α-CD3/CD28-stimulated TSCM cells. While the E001-stimulated TSCM cells showed no significant differentiation after 24 h, the response was similar to that of non-stimulated TSCM cells (Fig. 3a, b). In addition, after 24 h of incubation with E007 and α-CD3/CD28, we found that TSCM cells in the incubation showed no significant change in absolute number (Additional file 3: Figure S3E), suggesting that TSCM cells were able to self-renew during proliferation and differentiation. CD8+ T cell mediated immune effectors include production of cytokines and killing of target cells. To investigate production of cytokines, the TSCM cells were stimulated with E007, E001, and α-CD3/CD28 beads, then intracellular IL-2, TNF-α, and IFN-γ production was measured. The E007-restimulated TSCM cells showed more positive cells of these cytokines. Gating with CD62L, the incubated bulks were divided into CD62L+ (TSCM and TCM) and CD62L- (TEM and TEF) cells, most of the cytokine positive cells were TEM and TEF cells (Fig. 3c). Meanwhile, gating with CD45RA, we found that both TEM and TEF cells showed similar frequency of the cytokine positive cells (Additional file 3: Figure S3A-D). Whereas, the TSCM cells in the incubation produced almost background IL-2, and only a low level of TNF-α and IFN-γ. The TSCM cells responded against α-CD3/CD28 in a similar profile of the cytokine production to that against E007. In contrast, the TSCM cells stimulated with E001 showed frequency of cytokine-positive cells in the same way as that with non-stimulation (Fig. 3c–f). Next, we moved to cytotoxicity assay, the TSCM co-cultured with E007 or E001 for 24 h at a ratio 5:1. Killing rate of the TSCM and daughter cells against E007 was higher than that against E001 after 8 h (Additional file 3: Figure S3F, G). These results showed that the prepared TSCM cells were E007-specific and able to differentiate rapidly into effector T cells after stimulated by the same antigen. To evaluate capacity of persistence and rejecting target cells in vivo of the prepared TSCM cells, human LCL cells E001 or E007 were inoculated intravenously into NOD/SCID mice to establish LCL-burden mouse model. After 3 days, the LCL-burden mice were treated with either E007-specific TSCM cells or E007-specific TEM and TEF cells (Fig. 4a, b). On days 7, 14, 21, 28, and 35 after T cell infusion, caudal vein peripheral blood samples were taken to detect the frequency and phenotype of human T cells. We found human CD3+ CD8+ T cells in the peripheral blood of the TSCM-treated mice at all sampling times. However, in the TEM + EF-treated mice (E007-TEM + EF), human T cells were detected in peripheral blood on day 7, but not on day 14 or later (Fig. 4c). In the TSCM-treated mice, the frequency of TSCM cells in the E007-burden mice (E007-TSCM) were lower than that in the E001-burden mice (E001-TSCM), but no difference was found in the absolute number of TSCM cells between E007-burden and E001-burden mice (Fig. 4d, e). On day 35, more frequent human T cells were found in the spleen and bone marrow of the TSCM-treated mice revealed by flow cytometry (Fig. 5a), and the immunofluorescent staining of the spleen sections showed the similar results (Fig. 6d, e). These findings indicated that the TSCM cells were able to survive long through self-renewal in the mice, and differentiate into other T cell subsets as stimulated with the specific antigens of E007. To investigate the immune reconstitution capacity of the TSCM cells, peripheral blood, spleen, and bone marrow of TSCM-treated and TEM + EF-treated mice were tested for human T cells on day 35. The human T cells in the above specimens consisted of TSCM (CD45RA + CD62L+), TCM (CD45RA-CD62L+), TEM (CD45RA-CD62L-), and TEF (CD45RA+ CD62L-). The distribution of T cell subsets revealed more TEM and TEF cells in the E007-burden mice, whereas more TSCM and TCM cells in the E001-burden mice (Fig. 5b). As TEM and TEF cells are at terminal differentiation stage while TSCM and TCM cells at early differentiation stage, our findings suggested the E007-specific TSCM cells differentiated into the other T cell subsets when they came cross the same antigen in the E007 burden mice. To analyze killing efficacy of the TSCM cells in vivo, on day 35 of the T cell treatment, the residual LCL cells in mice were detected by intracellular LMP1 staining. The LCL cells were mainly found in the spleen and bone marrow of the LCL-burden mice. In the E007-burden mice, the residual LCL cells in spleen and bone marrow of the TSCM-treated mice were similar to that of the control mice without LCL infusion (control). Nevertheless, the TEM + EF-treated mice carried a significant amount of the residual LCL cells compared to the control mice, but the amount was lower than the E007-burden mice without T cell treatment (E007) (Fig. 6a–c). More residual LCL cells were also found in the immunofluorescent spleen sections of the TEM + EF-treated mice than those of the TSCM-treated mice (Fig. 6d, e) These data demonstrated the TSCM cells equipped with superior capacity of killing targets of specific antigens in vivo compared to the TEM and TEF cells. In contrast to the E007-burden mice, the E001-burden mice bore not only less TEM and TEF cells after the TSCM treatment, but also the residual LCL cells as high as that of the E007-burden mice without T cell treatment (Fig. 6a–c). Results of immunofluorescence staining of spleen sections for human T cells and LCLs showed residual LCL cells in E007-burden mice treated with TSCM were similar to those of the control mice. 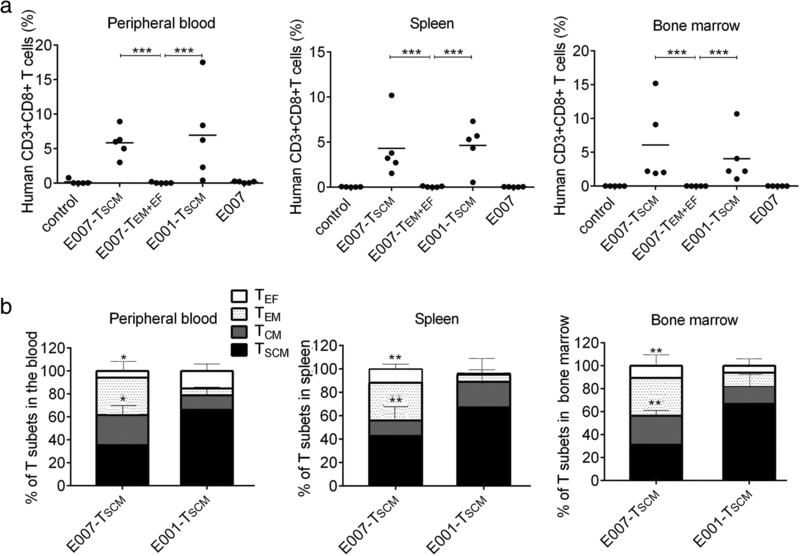 Although the spleen of the E001-burden mice showed a significant number of human T cells, the residual LCL cells were similar to that of the E007-burden mice without T cell treatment (Fig. 6d, e). By the way, the human T cell-treated mice showed no sign of xenogeneic graft-versus-host disease (xeno-GVHD), such as loss of body weight, back arched, and shed. Collectively, these results indicated that the prepared TSCM cells were able to survive over a long-term in vivo and differentiate into effector T cells to eradicate the target bearing the cognate antigens. Mature T cells are comprised of cells that are at various stages of differentiation, which are discernible by the expression of surface molecules. TN cells are conventionally defined by the co-expression of the CD45RA, CCR7, and the lymph node homing molecules L-selectin (CD62L) . Similar to TN cells, CD62L and CCR7 are maintained on TCM cells, whereas these molecules are lost on more differentiated TEM cells [3, 35]. TSCM cells, the least differentiated of all distinct memory populations, are identifiable through the expression of markers, including CD62L, CCR7, CD95, and the chemokine (C-X-C motif) receptor 3 [5, 10, 36]. 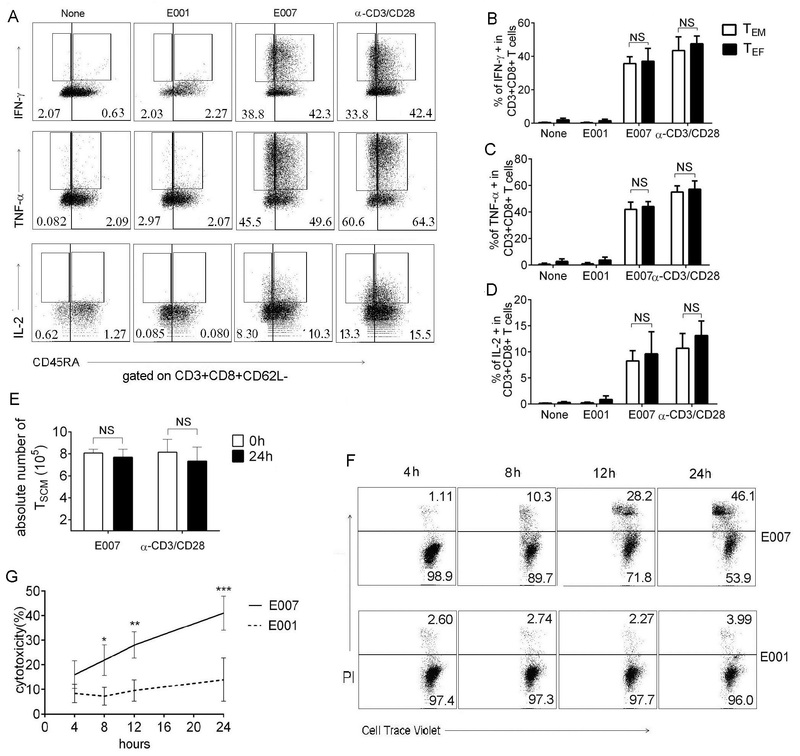 Naïve T cells downregulate CD62L expression after stimulation, as clonal expansion goes on, both CD62LLOW and CD62LHIGH T cell subsets are developed. 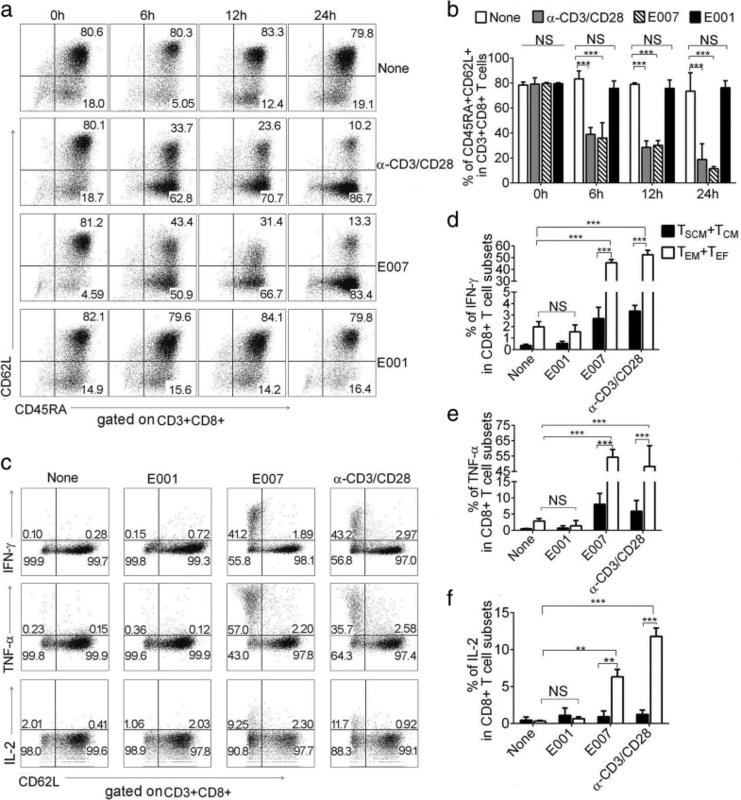 With real-time tracking of CD8 T-cell divisions in vitro, Kinjyo and co-workers define memory T cells among CD62LHIGH cells. The memory T cells stay CD62LHIGH and proliferate in vitro driven by IL-2, although the division duration is slow, the phenotype and cell cycle duration are inherited by the progeny of the T cells . We identified CD8+ TSCM subset in the co-culture bulks by the phenotypes CD3+ CD8+ CD45RA+ CD62L+ CCR7+ CD95+ CD28+, as our results showed the cells with the phenotypes in the co-culture bulks were of stem cell and memory T cell properties. A frequently used method to enrich TSCM cells is differentiation inhibition. With antigen priming, antigen-specific CD8+ TN cells proliferate and develop into TSCM cells first and then the other subsets. It is reported that TSCM differentiation can be inhibited by TWS119, which inhibits the GSK-3β and activate Wnt/β-catenin. The inhibition improves the maintenance of ‘stemness’ in mature memory CD8+ T cells which mediated a better anti-tumor response after transferred into mice [15, 38]. Rapamycin is also reported to help the formation of T cell subset at an early stage of differentiation by modulation of mTOR signaling [39–41]. However, rapamycin tended to promote the generation of TCM cells in our study (Additional file 1: Figure S1C), in line with other report . In our co-culture of E007 with allogeneic PBLs, the E007-specific TSCM cells were generated from TN and enriched in the presence of TWS119 which inhibited the TSCM further differentiation. 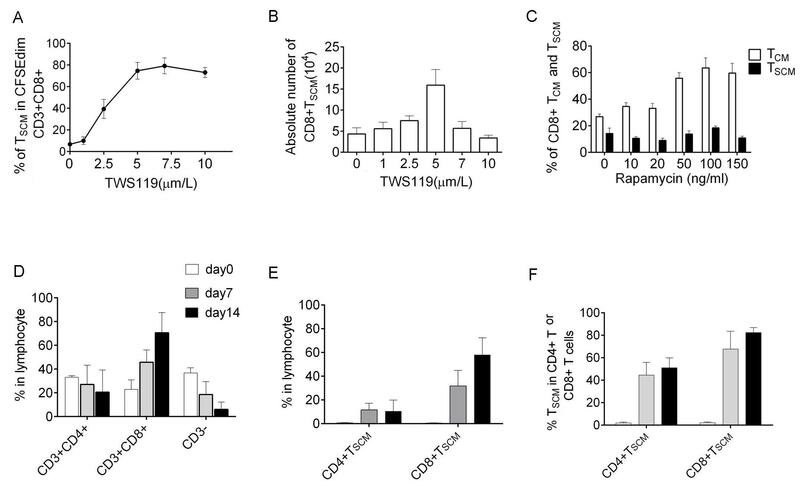 As inhibition by TWS119 results in a TSCM phenotype in human CD8+ T cells [5, 15, 16], our protocol preferred expansion of CD8+ TSCM to that of CD4+ TSCM. The administration of cytokines is another method to expand TSCM. Cytokines have important functions related to T cell expansion, differentiation, survival, and homeostasis. Common γ-chain (γc) family cytokines are commonly used in clinical trials, including IL-2, IL-7, IL-15, and IL-21. IL-7 is instrumental for the generation of TSCM cells by binding to IL-7 receptor expressing naive and memory T lymphocytes [42, 43]. Expansion of TSCM required either IL-15 or IL-2; IL-15 proves superior to IL-2 in supporting expansion coupled to preservation of the TSCM phenotype [18, 19]. Activated naive T cells show a higher expression of IL-21 receptor, and IL-21 has been reported to be able to enrich less differentiated TSCM within the total TSCM subset [20, 22, 23, 44]. However, IL-21 exerted few effects on the TSCM expansion in our study. Therefore, IL-7 and IL-15 were used to expand the TSCM cells after the proliferation sorting, resulting in a large number of the TSCM sufficient for the experiments in vitro and in vivo included in our study. An important feature of stem cells is the self-renewal capacity. Although self-renewal abilities of the prepared TSCM cells were revealed by TREC copy numbers and proliferative history driven by IL-2 in vitro, long-term in vivo implantation is the gold standard for identification of stem cells. Long-lasting survival of human TSCM cells in mice is reported. In serial transplantations model, TSCM cells prove able to persist in secondary recipients suggesting self-renewal abilities [5, 6, 19, 45]. Here, the prepared TSCM migrated to secondary lymphoid organs, such as bone marrow and spleen, showed long-lasting survival potential at least for 35 days after transferred in our model. Importantly, the number of TSCM cells in the blood samples was observed consistent during this study, suggesting the self-renewal capacity of the transferred TSCM cells in vivo. The implantation and long-term existence of the TSCM cells in the host would be expected to mount durable T cell responses after transferring. Governing antigen specificity is important for TSCM preparation; various strategies are used for this purpose. For example, HCMV-specific TSCM cells are isolated from peripheral blood TSCM cells of HCMV seropositive donors and enriched in vitro by incubation with HCMV antigen . CD19-specific TSCM cells are prepared from peripheral blood TN and TSCM by transduction with a γ-retroviral vector encoding the CD19-chimeric antigen receptor (CAR) . TCR-transgenic mice are also a source of antigen-specific TSCM cells . In our approach, the E007-specific T cells underwent proliferation in the co-culture bulks, making it feasible to be sorted by CFSE dilution. In our pre-experiment, IL-7 or IL-15 was able to make PBLs proliferation without the E007 stimulation. Hence, no cytokine was added to the co-culture before the sorting, to ensure the E007-specificity of the prepared TSCM cells. Two HLA class I mismatched LCLs, E007 and E001, were used to examine the antigen specificity of the prepared CD8+ TSCM cells. 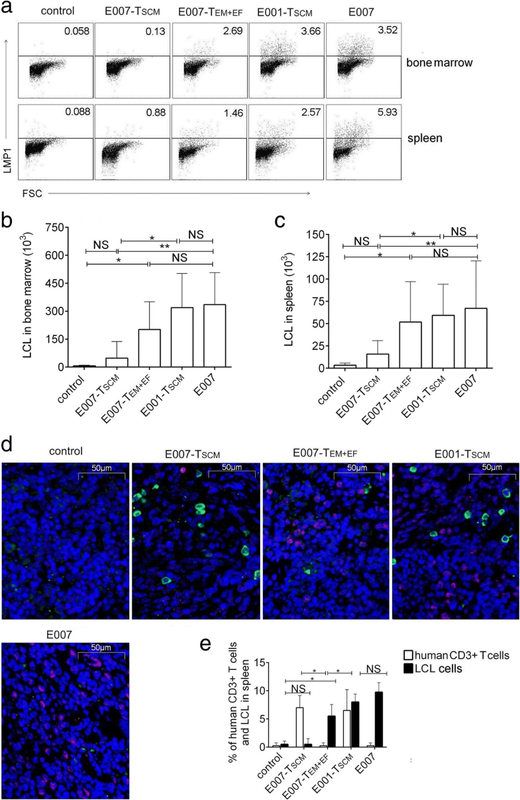 Rapid differentiation into effector T cells and robust effector functions were observed when the prepared TSCM cells were stimulated with the E007, but not with the E001. Although the E007-specificity was suggested by these in vitro findings, it would be more important to observe the behavior of the prepared TSCM cells in vivo. In our LCL burden mouse model, LCL cells could be found in spleen and bone marrow up to 45 days after transfer into the immunodeficiency mice in our preliminary test. The LCL burden mice showed no measurable side effect during our study, such as loss of body weight, back arched, and shed. Interestingly, the prepared TSCM cells exhibited intensive differentiation into other T cell subsets and effective eradication of LCL targets in the E007-burden mice instead of the E001-burden mice. These observations reflected the prepared TSCM cells were E007-specific. Functional allo-specific CD8+ TSCM cells were prepared from human PBLs in a procedure of allogeneic co-culture, differentiation inhibition, proliferation sorting, and cytokine expansion. Although our study provided a practical protocol for allo-specific TSCM cell preparation, this method would be adapted to prepare TSCM cells specific for antigen of interesting. As TSCM cells show the implantation and long-term existence in the host after transferring, the preparation of antigen-specific TSCM cells is crucial for T cell adoptive immunotherapy. The authors apologize to colleagues whose work could not be cited because of space limitation. They thank Dr. Jinghui Zhang (The Union Hospital, Tongji Medical College, Huazhong University of Science and Technology) for the FACS sorting in this study. This project was supported by the National Natural Science Foundation of China (no. 31370885). XWW designed the study, analyzed the data, and wrote the manuscript. LG was a major contributor in the experimental performance, analyzed the data, and wrote the manuscript. XL performed and analyzed the cell culture experiments. JW contributed to the animal experimental performance. XFW contributed to the design of study. ZL contributed to the data analysis. JY contributed to the manuscript preparation. All authors read and approved the final manuscript. All donors’ samples were obtained after informed consent according to a protocol approved by the Ethics Committee of Tongji Medical College, Wuhan, China. Animal experiments were approved by the Ethics Committee of Tongji Medical College. All animal procedures were performed in strict accordance with the guidelines of the Chinese Council on Animal Care. Biasco L, Scala S, Basso Ricci L, Dionisio F, Baricord C, Calabria A, et al. In vivo tracking of T cells in humans unveils decade-long survival and activity of genetically modifed T memory stem cells. Sci Transl Med. 2015. https://doi.org/scitranslmed/scitranslmed 3010314. Flynn JK, Gorry PR. Stem memory T cells (TSCM)-their role in cancer and HIV immunotherapies. Clin Transl Immunology. 2014. https://doi.org/10.1038/cti. Xu L, Zhang Y, Luo G, Li Y. The role of stem cell memory T cells in hematological malignancies. J Hematol Oncol. 2015. https://doi.org/10.1186/s13045-015-0214-5. Fuertes Marraco SA, Soneson C, Caqnon L, Gannon PO, Allard M, Allard Maillard S, et al. Long-lasting stem cell–like memory CD8+ T cells with a naive-like profile upon yellow fever vaccination. Sci Transl Med. 2015. https://doi.org/scitranslmed/scitranslmed aaa3700. Morrot A. Lifelong protection mediated by stem cell-like CD8(+) T memory subset cells (TSCM) induced by vaccination. Ann Transl Med 2016; doi: https://doi.org/10.21037/atm.2016.05.38. Forget MA, Huon Y, Reuben A. Stimulation of Wnt/β-catenin pathway in human CD8+ T lymphocytes from blood and lung tumors leads to a shared young/memory phenotype. PLoS One. 2012. https://doi.org/10.1371/journal.pone.0041074. Alvarez-Fernandez C, Escriba-Garcia L, Vidal S, Sierra J, Briones J. A short CD3/CD28 costimulation combined with IL-21 enhance the generation of human memory stem T cells for adoptive immunotherapy. J Transl Med. 2016. https://doi.org/10.1186/s12967-016-0973-y. Kinjyo I, Qin J, Tan SY, Wellard CJ, Mrass P, Ritchie W, et al. Real-time tracking of cell cycle progression during CD8+ effector and memory T-cell differentiation. Nat Commun. 2015. https://doi.org/10.1038/ncomms7301. Kagoya Y, Nakatsugawa M, Ochi T, Cen Y, Guo T, Anczurowski M, Saso K, et al. Transient stimulation expands superior antitumor T cells for adoptive therapy. JCI insight. 2017. https://doi.org/10.1172/jci.insight.89580.